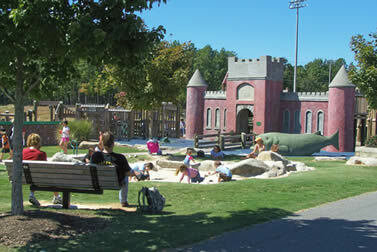 In 1995, the Gastonia City Council, Gaston County Commissioners, and the Gaston County School Board collectively worked to deed an existing 20-acre passive park (named Martha Rivers Park, after the daughter of the original landowner), and 34 adjoining acres, originally purchased as a future school site, to the City for a Youth Sports Complex. The City then purchased an additional three adjacent acres bringing the total park size to 57.95 acres. Two phases of construction took place between 1997 and 2001 to produce the present facility. The park features four, lighted soccer fields; three, lighted youth baseball fields; one lighted youth softball field, two batting cages, and a scorers’ tower with a concessions stand and restrooms. There is one small play area within the baseball complex area. Paved walking trails loop around the outer edge of the baseball fields, playground and soccer fields with several adjoining crossovers to vary distance and geography. There are two large picnic shelters, a sand volleyball court, two horseshoe courts, and a restroom building. The highlight for most children who visit the park is the result of Operation Playground – a one-acre playground designed by children, and built by hundreds of community volunteers who were organized by a group of dedicated citizens using thousands of private fund donations. 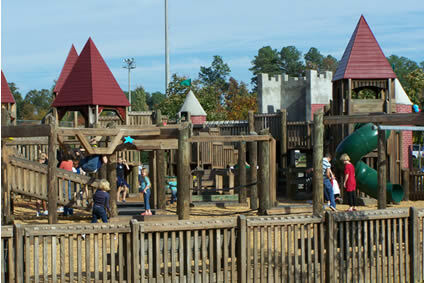 The largely wooden structure, simply referred to as “the castle” consists of multiple levels and includes such features as a fort, a ship, a race car, swings, slides, a sand pit in which to dig “dinosaur” bones, places to hide, things to climb, places to explore and more, all interconnected by a series of ramps and catwalks above a safe, rubberized surface. Hours of Operation: Dawn - Dusk, daily. Lighted outdoor fields operate independently when scheduled. The Administrative Office schedules picnic shelter reservations for Martha Rivers Park with daily sessions of 10AM-2PM and 3PM-7PM. The Athletics Office schedules all field use at Martha Rivers Park.